Wilmington & Western founder Tom Marshall speaks at an event celebrating the 50th anniversary of Greenbank Station. WILMINGTON, Del. — Thomas C. Marshall Jr., founder of the Wilmington & Western steam excursion railroad in northern Delaware, died Feb. 12, 2019, just eight days short of his 95th birthday, after a lengthy illness. In addition to being well known in Delaware as a philanthropist, historian, and community leader, he was widely respected among antique car collectors all over North America as one of the world’s foremost authorities on Stanley Steamer automobiles. 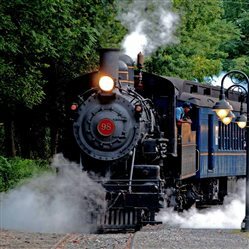 He also owned and operated an extensive 7 ½-inch gauge live-steam railroad on Auburn Heights, the estate of the Victorian-era mansion built by his grandparents in 1897 in Yorklyn, Del. A lifelong, second-generation steam railroad enthusiast, Marshall was born into an industrialist family whose holdings included a rolling mill at Marshallton, Del., and a paper mill and a vulcanized fiber plant at Yorklyn, Del., close to the Pennsylvania border. After graduating from Wilmington Friends School in 1941, Marshall attended Mercersburg Academy for a year before going on to M.I.T. in 1942-43. He served in the U.S. Army from 1942-46 as a weather forecaster in New Mexico and then as an aerial weather observer on a B-24 flight crew in the Western Pacific. It was while in this capacity that he had the privilege of flying low over the USS Missouri in Tokyo Harbor on the day after the surrender ceremony on that ship brought an official end to World War II. Marshall’s post-war business career focused on tourism and travel in northern Delaware. He founded and operated a travel agency from 1949 to 1963, Marshall & Burton Travel Associates (later to become Marshall & Greenplate). He opened the first of his two Holiday Inns in Wilmington in 1961 and operated them for 36 years. Marshall’s greatest impact on the Wilmington community came from his non-profit and philanthropic activities. He was long active in historic preservation and public recreation efforts throughout the area. 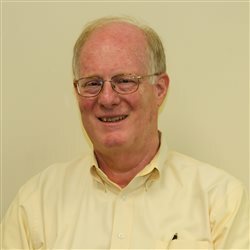 His most notable achievement was the founding in 1959 of Historic Red Clay Valley, Inc, a nonprofit set up to explore the prospect of steam excursion operations on the Baltimore & Ohio's scenic Landenberg Branch between Marshallton and Hockessin, Del., opened in 1872, and acquisition of equipment for its operation. Marshall and his father acquired ex-Canadian National 2-6-0 No. 92 in 1959 and former Mississippi Central 4-4-0 No. 98 in Feb. 1960. Excursions started in May 1966 as the Wilmington & Western Railroad using No. 92, ex-Delaware, Lackawanna & Western "Boonton" coaches, and weekend trackage rights on the branch. HRCV would later purchase the entire railroad from corporate successor Chessie System in September 1982; included in that purchase was B&O SW1 No. 8408, built in 1940 and now restored to original appearance. The railroad also now operates former Atlanta, Birmingham & Atlantic 0-6-0 No. 58 and restored Pennsylvania RR diesel-electric "doodlebug" No. 4662, along with two ex-B&O wooden cabooses, a steel ex-Erie caboose, and other passenger cars. HRCV also undertook the preservation of the Greenbank Mill, a water-powered mill adjacent to its Greenbank terminal, later spun off to a separate group, Greenbank Mill Associates. Marshall served as the HRCV’s first President and General Manager from 1965 through 1971, and he remained active as a volunteer and board member for many years thereafter. Marshall was intimately involved in every aspect of the tourist railroad's operation, from negotiating with the B&O for trackage rights to operate steam trains over their branch line, to restoring and operating a 1910 steam locomotive, to cleaning the public restrooms at the Greenbank Station terminal. Marshall and his father, Clarence, shared a lifelong interest in steam technology, whether on the rails, in the family’s manufacturing plants, or on the road. Clarence had served as the sales agent for the Stanley Motor Carriage Co. – “Stanley Steamers” – from 1910 to 1920, and he began collecting, restoring and operating them in 1940, a hobby that would last throughout his life and which Tom would inherit and embrace enthusiastically. The Marshalls’ collection of Stanley steam cars would come to be recognized as the world’s definitive collection of such cars. Tom Marshall worked tirelessly to restore and maintain the cars, and he loved to drive them on trips both long and short. He steamed his 1912 30-horsepower Stanley touring car on four transcontinental tours, the longest of which was an 8,328-mile trip from Yorklyn to Montreal, Canada, and Tijuana, Mexico, and return in 1972 – very likely the longest single trip ever made in a Stanley Steamer. Other vintage automobiles were also added to the collection over time. In the late 1990s, Tom Marshall was looking for a way to share his love of antique cars and steam trains with a new generation, so he presented a series of talks and workshops on steam car technology at Auburn Heights. The group attending these gatherings became known as the “Marshall Steam Team” and evolved into the non-profit Friends of Auburn Heights Preserve in 2004. He donated his collection of antique cars, live steam trains and other collectibles to the Friends, whose 80+ volunteers still maintain and operate the cars and miniature steam railroad for the public to enjoy at Auburn Heights. He and his wife moved from Auburn Heights in 2008, when they donated it to the state of Delaware to become the centerpiece of the new Auburn Valley State Park. The approximately 360-acre park now consists of open space donated by Tom and his cousin, Eleanor Marshall Reynolds, as well as adjacent properties and mill buildings of the former NVF Company purchased by the state after NVF went out of business, and wetlands, hardwood forest and farm fields. He is survived by Ruth Pierson Marshall, his wife of 34½ years. Details on services and memorial donations will be shared at auburnheights.org when available.